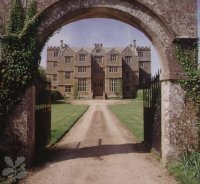 Chastleton House is one of England's finest and most complete Jacobean houses. It is filled with a mixture of rare and everyday objects, furniture and textiles collected since its completion in 1612 by members of one family, in continuous occupation. The gardens are typically Elizabethan and Jacobean with a ring of fascinating topiary at their heart. This house is being conserved rather than restored by The National Trust. Private views each Wednesday and themed events on last Saturday of each month during open season. Admission by timed ticket, which can be reserved by contacting the property. Free Parking 270 yards. Return walk to car-park includes a short but steep hill. Approach only from A436 between A44 (W of Chipping Norton) and Stow.